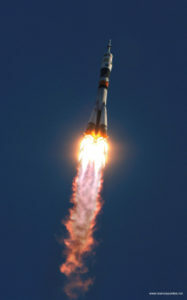 This March, 12 years ago, the Brazilian Air Force (FAB) Lieutenant Colonel Marcos Cesar Pontes left for the ISS (International Space Station) aboard the Russian Soyuz TMA-8. Currently in the reserve, the first Brazilian astronaut published books, was elected one of the 100 greatest Brazilians of all time, works at NASA and also at the United Nations. Pontes kindly received the Carvalho News report to talk about space, OVINs, Brazilian Space Program and more. Do you want to embark on this trip with us? Then read the interview below. Good reading! Blog Carvalho News – How was your childhood? Ever dreamed of being an astronaut when you were little? Marcos Pontes – My childhood in Bauru was very happy with my mother, D. Zuleika, my father, Sr. Virgílio and my brothers Rosa and Luiz Carlos. At this time I had the dream of flying, of being a pilot. He looked at the sky and wondered what it would be like to travel through that vastness. I fulfilled that dream when I passed the entrance exam of the Air Force Academy – AFA. After having already had ample experience in flights, the opportunity of the Public Course for the first Brazilian astronaut, I was selected and, after much training and effort, I was able to realize the First Brazilian Space Mission. The reality turned out to be bigger than the dream! I count all the details in my book “Mission Accomplished”, that can be acquired in the virtual store www.conexaoespacial.com.br. 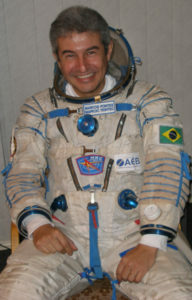 Carvalho News – In March, the first Brazilian manned space mission completed 12 years. What better memories do you have of this period? Marcos Pontes – The sensation of looking at the Brazilian flag on my arm and seeing the Earth from space for the first time. Carvalho News – How is the Brazilian Space Program? When will we have other trips to space? Marcos Pontes – At the moment the Brazilian Space Program walks slowly, unfortunately. In fact, all S & T sectors have suffered from recurrent political and economic crises in the country. This is worrying for the future of national development. My agreement with AEB won last year (10 years after the mission). Without renewal, I continue to be linked to space projects in the US and I must return to space in the next few years. Carvalho News – What kind of activities do you develop at the Johnson Space Center in Houston (USA)? Carvalho News – What do you feel when you look at the Earth from space? Marcos Pontes – The sensation is wonderful and at the same time worrying. From space, we can see the devastation of some places on Earth, caused by deforestation, wars and so on. The planet seen from above is so beautiful that if we were aware that it was all part of something much larger, we might take care of our home more. See Chapter 77 of my book “Mission Accomplished” for more details. Carvalho News – Do you believe in the existence of OVINs? Marcos Pontes – By definition, any flying object or natural effect that we can not identify, must be called a UFO. So it is not a matter of believing, by definition they are a fact. Carvalho News – Do you know of a story involving aliens? Carvalho News – In 2014, you ran for the post of federal deputy for PSB of São Paulo. What led you to take this initiative? Do you still have political aspirations? Marcos Pontes – Literally, thousands of people have always asked me to contribute my knowledge and professional experience in the National Congress, especially in the legislation associated with the country’s economic development through Education, Science and Technology. Among these people was our late Minister Eduardo Campos, who was president of PSB and my personal friend for many years. I answered the request and applied. I made a small campaign, according to the possibility and logic of the relationship “campaign spending x deputy salary” (which many people seem to forget), and got 43,000 votes. An expressive number, but a little smaller than necessary in that year to be elected. For me, it was an interesting life experience and the removal of a burden from the back: no one can say that I did not have the courage to introduce myself to help in the Congress. I did my part. As for current political pretensions, I wish the elect success and wisdom. If you need a consultant, I’m at your disposal. Carvalho News – Can the public await any news from the writer Marcos Pontes? Marcos Pontes – Yes! I have a technical book on “Human Error” in accident prevention at 70% of the end. In addition, I am working on other literary projects for children’s books and in the area of coaching. Carvalho News – What did it mean to be elected one of the “100 greatest Brazilians of all time”? Marcos Pontes – It was an honor to have my work recognized and motivation to inspire more young people to conquer their dreams. Just remember that my father was “general service servant” to understand what I feel about it. What few people know is that, in the case of my career, the best result, or more impressive in terms of legacy is yet to come … but I will not do anything yet. Carvalho News – How is your day to day life? What do you usually do when you are off duty? 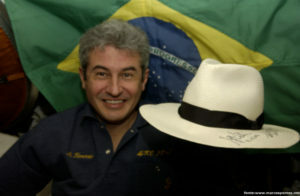 Marcos Pontes – My life is divided into intense schedules with activity at NASA, the UN (I am an ambassador for industrial development), in my business and function to train people, either as a “life coach”, mentor, or ministering to hundreds of training and lectures (things I love doing). Interesting that I do not see any of this as “work.” I love what I do. That is, I earn my living by doing what I like, and that is very good. Therefore, in periods of slack … I do the same things, with a few extras: read a lot, write, draw, photograph, music, etc. 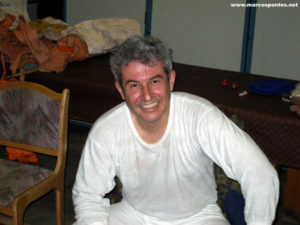 There are more details about my activities on my website www.marcospontes.com.br.